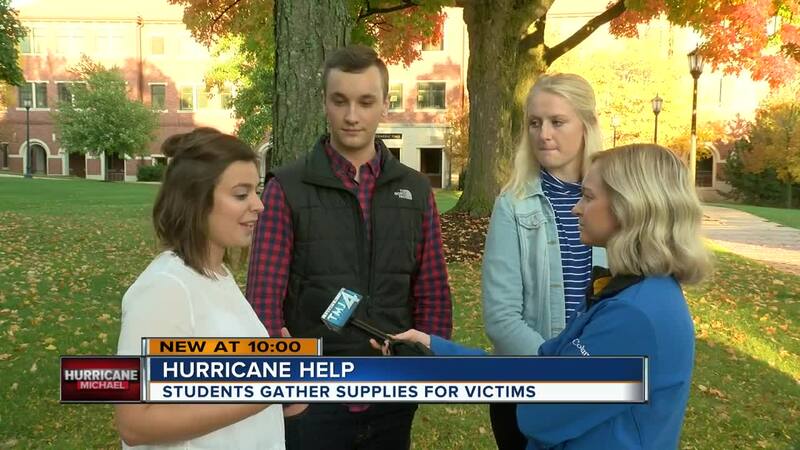 Three Wisconsin college students are driving to Florida on Friday to bring supplies they've collected for hurricane victims. Joshua Murphy, Michelle Boldt and Emalie Hahn are all juniors at Wisconsin Lutheran College. They've been collecting supplies for the last month, originally hoping to help in North Carolina. A church they had been in contact with there recommended going to Florida instead as they knew Hurricane Michael would be devastating. "They need the supplies more than we do and we're happy to help," said Boldt. Hurricane Michael made landfall Wednesday, knocking out power initially to more than 300,000 people. "We have a lot of canned goods, we have a lot of cereal, we have a lot of cleaning supplies, water bottles," said Boldt. With help from their campus and community, the students have also raised nearly $800 to buy additional supplies. "The more we get, the bigger trailer we get, we're more than happy to take it," said Murphy. They are working with a church in Panama City and will focus their efforts there. "A lot of people look down on our generation, ' you're young, you can't make a difference,' " said Murphy. "We really want this trip to inspire others, not only our community, but throughout the United States, young people can make a difference and they can have an impact in their community." To help with their efforts, visit their Facebook fundraiser for more information.